The original formula is quite frankly priceless, however for newer cars waterborne technology in coatings, xirallic and metallic composite acrylic paints are softer than the paint of yesteryear. In the retail market where paint does not discolour or fade in the same way (especially red pigmented paint) the full need to restore the original colour is not required. Despite this, scratches and swirl marks still happen (especially noticeable on black cars) and thus a cutting compound is still needed in order to remove a microscopic layer of paint. As a result, Tetrosyl is launching a new T-Cut product that is for today’s vehicles and today’s consumer needs, named T-Cut Rapid Scratch Remover. This less abrasive product will cater perfectly to the thinner paint found on modern vehicles, but will otherwise function in exactly the same way as The Original Restorer. The main reason for buying T-Cut for cars is to remove scratches, and therefore T-Cut Rapid Scratch Remover will replace T-Cut Original Colour Restorer in the distinctive red bottle. But don’t panic because the trusted and proven T-Cut Original Restorer is going to live on. Millions of hobbyists, professionals and craftsmen will be able to buy The Original Restorer in the tin as it was over 60 years ago. Gone is the plastic bottle, and in is the nostalgia of a tin. 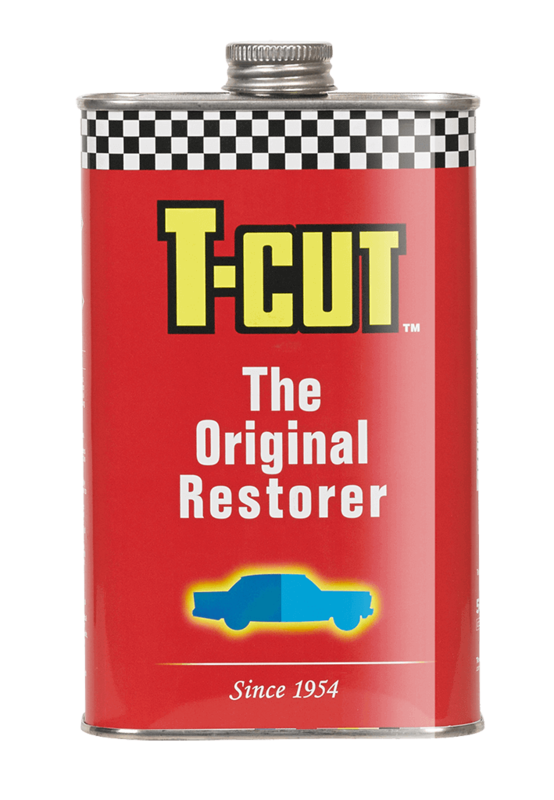 T-Cut The Original Restorer will be available in 300ml, 500ml, 2.5 litre and 5 litre tins, almost identical to how it was six decades ago. Our new product, T-Cut Rapid Scratch Remover, will be available in a 150g tube or in a 500ml plastic bottle.